YOU WANT TO HIRE A CONTRACTOR? The cost of the managed device: The contractor needs to get access to the company`s files and applications in order to do their work. Usually, a company provides the device (laptop, tablet…) which put an extra burden on the budget. The costs have to cover hardware and the management of this device. Added to that there are also costs associated to set up a device and enable the right permissions for a contractor. No usage audit: Following this practice, companies often don`t have a well implemented and proper usage auditing system. The auditing is quite tricky because obviously, companies can`t cross the limits of privacy laws. Bottom-line is that a lot of companies spend a great amount of money providing IT access to contractors without having any usage audit records in place. There is no local data stored on the device. NO AUTHENTICATION HASSLE: For temporary contractors, you can leverage Multi-Factor Authentication. Generate an SMS (for example) as 2nd factor authentication to the contractor for one-time access. NO MOBILITY ISSUES: The contractor can work from where he wishes, as long as it`s compliant with the rules and wishes of the contracting company. This can potentially even drive additional savings in office space while contractors can benefit from mobile working. Do you need more reasons? 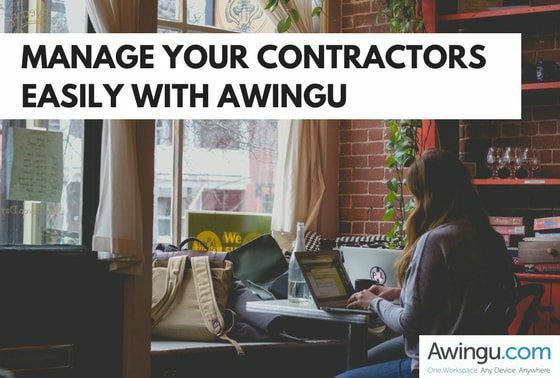 Let us know at info@awingu.com or try it yourself in a 14-days free trial!